The Louisiana Folklife Festival, 1979-1992 collection is made up of records relating to the planning, production, and carrying out of the Louisiana Folklife Festival. Including correspondence, budgets, contracts, grant application materials, reports, press releases, brochures, programs, and newspaper clippings; the collection also comprises 265 cassette tapes, 128 cassette tape indexes, and 8 video recordings on VHS, UMATIC, and UMATIC-S tapes relating to the festival and its fieldwork. Cooksey, John. “Louisiana: Louisiana Folklife Festival (Local Legacies: Celebrating Community Roots - Library of Congress).” American Memory from the Library of Congress. http://memory.loc.gov/diglib/legacies/LA/200003078.html. 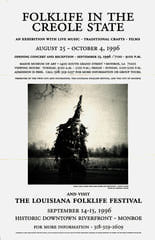 The cover image, located in OS:L Box 1 Folder 6, is a flyer for an exhibition which took place at the Louisiana Folklife Festival of 1996.